When Spouse and I lived in California we took a train journey one Christmastime. We wanted to experience the railways in the United States, and it was a rather charming time of year to venture to a new city. We set out for Oakland; our destination was Jack London Square. The train, as friends had warned us was a possibility, was halted on the tracks for more than two hours for undisclosed reasons. Spouse and I were prepared with our books, snacks and water, our camera and a reasonable amount of good humour. We vowed to enjoy the time despite the setback- after all, our primary purpose had been to take a train journey. Oakland was merely the place for us to stretch our legs and wander about for a while in the bite of early December. 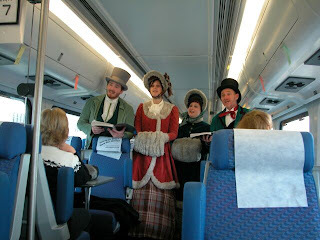 After the train began to move again and some time had lapsed, we were entertained by some jovial musicians: the hearty quartet of men and women dressed in Dickensian garb bounded into our carriage and proceeded to sing some rousing Christmas carols. Their choruses were delightful and the singers appeared to be having the time of their lives, enthusiastically pouring out melodies for the pleasure of the holiday travellers. I recall that they did an especially lovely rendition of 'Away in a Manger,' their hushed voices blending in perfect harmony. The entire compartment was enraptured by the beaming troupe who had surprised us gratuitously with their talents. When that tune concluded, one of the singers asked if anybody had a musical request; they would sing to order for the benefit of their listeners. Then a lady, sitting in close proximity to the performers, said with supreme confidence and spirited joy of the season, "what about 'Away in a Manger?' I'd like to hear that." A dull silence blanketed the carriage and all eyes were transfixed in horror on the person who had just spoken and made a dreadful, foolish error. We each were aware of the impending embarrassment- except for the oblivious woman who waited eagerly for her choice to be sung. The leader of the group considered for a moment and then said as elegantly as he could, "well, we did just sing that one, but perhaps you'd like something else?" Thus the difficult encounter was banished after sufficient blushing and apologising transpired. I fiercely admire those who choose not to make little of people's faults and mistakes. The spirit of compassion was prevalent on the train that Winter afternoon; that little stroke of leniency completed its journey to Jack London Square and back again, to be marked, I hope, at least by some of those who were present. Gosh, I think I would have just sung it again. :<) There are two tunes, so maybe, just maybe she knew it by tune, not words??? What a nice thing for you two to have done together. I don't think she felt too badly about it, thanks to their kindly brushing it away... I didn't know there were two tunes. How interesting. Texican- that's absolutely true, usually there's someone to make a comment, but people were nice about that. No sense embarrassing people, we wouldn't like it on ourselves either. ah, small kindnesses, they're the best especially since we all have our moments when we don't have it together. To listen well... it's a hard lesson to learn, when we each have our own stories burning to escape into someone's ears, but it is the highest compliment we can pay. I didn't know there were two tunes to that song either - it was kind of the singers to be so causal and not caustic. Polona, I don't think anyone judged her harshly, just thought to themselves "how strange..." We'll never know the story but it's interesting. Wayfarer, and probably that's why nobody made her feel bad. They put themselves in her shoes for just a moment, I suppose, and acted accordingly. Pauline, I agree, listening surely is a great compliment. At times we get distracted and really don't hear something said right in front of us, but people are better known for being talkers than listeners!